The client, The Grocery Foundation, is a national charity that helps feed school children who don’t have access to healthy breakfasts through a variety of events, national campaigns and voucher programs. Their annual Toonies for Tummies campaign runs for two weeks every February, and all proceeds raised go towards local breakfast programs. There were two problems that the client wanted addressed. The first problem addressed was that their website wasn’t reflective of what they did. It needed to better reflect that the charity worked with children and raised funds for children. It had previously been too corporate, and the client wanted to make it appear more child-like. The ability to donate online was also lost on the website, so the charity wasn’t seeing as many online donatioins as they shoul dhave been. The second problem was surrounding the annual Toonies for Tummies campaign. Previously, the campaign had showcased images of children, but they were looking for something that was bolder and easier to understand at a quick glance. For the website, we worked with the client to bring a more childlike aspect to it; we used hand-drawn elements and a handwritten font to really embody the spirit of children. We also altered the donation call to action – making it stand out more from surrounding elements and ensuring it was always visible on the page. After an initial look was prepared, this look was brought over to most of the other campaign pieces to help people remember the campaign after seeing multiple pieces. We also worked to showcase the sponsors to help encourage shoppers to purchase from them during the campaign. 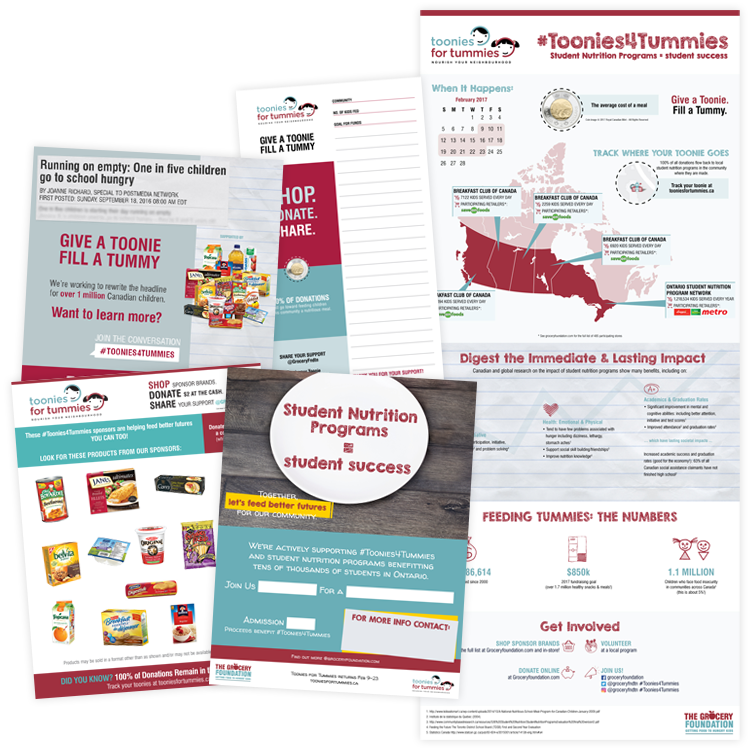 The changes to the website helped the client see a 300%increase in online donations for the 2017 Toonies for Tummies Campaign. The printed materials helped increase total donations (both in-store and online) by more than $200,000 over the previous year. An audience of 23M were reached through the printed materials, and sales for sponsors were up 61.7%from previous weeks. Ready to learn more? Book a free 30 minute strategy session and learn how we can help you move your website and marketing forward.